This article is about the modern state of the peninsula. For the worgen starting zone, see Gilneas (starting zone). For other uses, see Gilneas (disambiguation). The Ruins of Gilneas is a peninsula southwest of Silverpine Forest on the continent of Lordaeron. It is the name for the Gilneas zone after the events of the worgen starting experience. Horde players are sent here during the Silverpine Forest storyline quests. Otherwise, players will find the zone entirely deserted except for a few animals wandering about due to quest phasing. Between the Cataclysm and the Blood War, the peninsula was abandoned. After the Arathi Empire and the Kingdom of Quel'Thalas destroyed the Amani Empire around 2,800 years ago, the kingdom of Gilneas was one of the city-states founded with the spread of humanity. 2,700 years ago, a group of Gilneans would leave the peninsula and arrived on an island that they would later call Kul Tiras. Before the Third War, King Genn Greymane commanded the construction of the Greymane Wall which once finished separated the Gilnean peninsula from the kingdom's northern lands in Silverpine Forest. Following the events of the Invasion of Gilneas, casualties were heavy and the enemy even took the life of the prince and heir to the Gilnean throne, Liam Greymane. This forced the majority of the population to evacuate Gilneas to seek shelter in the night elven lands, while the Gilneas Liberation Front remained to continue fighting for freedom of their homeland. This region quickly became one of the main fronts in the war between the Alliance and the Horde following the Cataclysm. Alongside their new 7th Legion allies, the Gilnean forces clashed with the Forsaken armies marching beyond the ruined Greymane Wall. Through several battles, which ended in the loss of all the Forsaken bases aside from the Forsaken Front, the Liberation Front ended up cutting off most of the Forsaken's support and eventually removed the Forsaken from the area completely. This was achieved through the aid from their new allies in the Bloodfang pack, and 7th legion support in the form of naval soldiers and submarines (which proceed to destroy the entire Forsaken fleet in the area). The loss of the Forsaken Fleet was enough to turn the tide completely, forcing the Horde from the tattered kingdom entirely; though a small contingent was able to secure the body of Gilnean insurgent and former lord Vincent Godfrey, as well as his henchmen. Following the Forsaken defeat in Gilneas, Darius Crowley, leader of the Gilneas Liberation Front, led the final assault on Silverpine Forest, attempting to retake part of the land. However, Sylvanas, with Godfrey's aid, captured Lorna Crowley, Darius' daughter, and used her as a bargaining chip. With no other option to save his child, Crowley ordered the retreat from Silverpine in order to save Lorna from the undead; an act that angered Ivar Bloodfang greatly. Despite this loss however, the timely betrayal of Sylvanas by Vincent Godfrey ended up saving the Alliance from losing their grip on Gilneas, an unintended affect on Godfrey's behalf as he did not wish to save the Alliance (especially the Gilneans who made up most of the forces). His betrayal of Sylvanas, who was killed and then resurrected by her Val'kyr, left her too weakened to continue the assault to rout the Alliance from Gilneas, forcing the Horde to end their assault at the border of Silverpine; leaving Gilneas in Alliance hands and allowing their forces to retreat beyond the wall. In the aftermath of Silverpine, the Alliance had cemented their hold in Gilneas for a time. This allowed the Bloodfang to branch out into Hillsbrad Foothills to continue the fight against the Forsaken. With all Forsaken land bases either destroyed or recaptured by Alliance forces, the Forsaken begun to launch naval assaults on the area, starting an ongoing battle over the coastal region as the Alliance worked to repel the Forsaken's attempts to re-establish a land base within the peninsula. Aside from the battles on the coast, the situation within the peninsula was relatively silent until just before the demise of Deathwing. It was revealed by the Ravenholdt that the Gilneans had been infiltrated by a Black dragonflight member in disguise as an affluent noble by the name of Hiram Creed. Using his blood, Creed sought out to corrupt the Gilneans in secret, attempting to make them his pawns and make an army of draconically enhanced servants. Going by the name of the Blackhowl, the group was seen mostly within the walls of Gilneas City, protecting Creed from Forsaken assassins while they were unwittingly corrupted into his pawns. His schemes were ended, however, by an assassin working for the uncorrupted black dragon Wrathion, who had set out on a quest to kill every last black dragon on Azeroth (aside from himself of course). Following the death of Creed, it is unknown what became of the Blackhowl. Seeing as though they had no knowledge of Creed's plan to subvert them, or his status as a dragonkin, the group probably continues to guard Gilneas City, as they were most likely still affiliated with the Alliance. At some point after the death of Creed, both the Horde and Alliance withdrew from Gilneas' mainland for unknown reasons, leaving the only area of activity in the zone along the coastline where skirmishes were fought. By the time of the end of the Argus Campaign, Gilneas was referred to as fallen, with nothing but "wind, sorrow and ruin" in the land. When Genn arrived at Stromgarde Keep before the events of the Gathering, he told Anduin that both kingdoms were now in ruins, with Gilneas being home to the Forsaken and Stromgarde being overrun with criminals, ogres, and trolls. Sylvanas is cited as hoping to use the ruined status of Gilneas as an inciter among the Alliance after Teldrassil is captured. She erroneously attributes Genn Greymane's desire to reclaim his kingdom to cloud his judgment, causing a division within the Alliance between supporters who wished to reclaim Teldrassil and those who wished to reclaim Gilneas. Unbeknownst to Sylvanas, Greymane immediately claims that Teldrassil will need to be reclaimed first, with Gilneas coming after, as a gesture to repay the debt owed to the Night Elves by the Gilnean people. 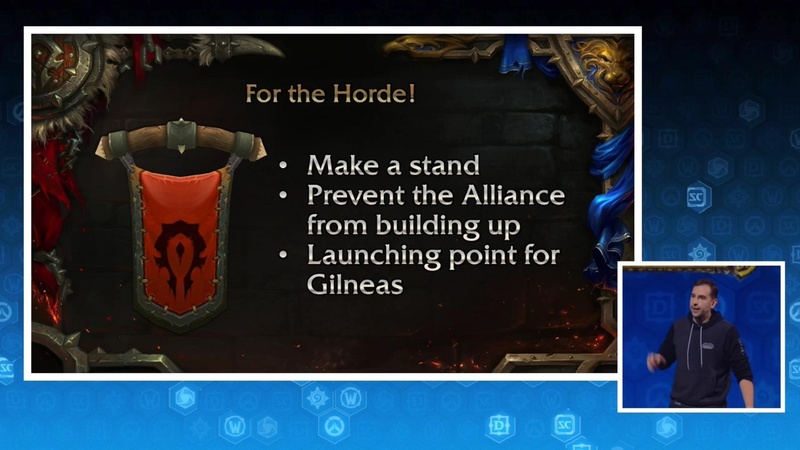 Gilneas is a point of interest for the Alliance and Horde forces in Lordaeron following the Battle for Lordaeron, with the Alliance seemingly having forces in the region. The 7th Legion has surrounded Shadowfang Keep, led by Captain Tobias Zaren, to prevent Chief Plaguebringer Harris from unleashing a new bio-weapon against Gilneas. At the same time, a Gilnean army marches under Darius Crowley assaulting the Horde-controlled region of the Sludge Fields, which is amassing undead to assail Gilneas. Following the destruction of the Undercity, the Horde moves on Arathi Highlands in an attempt to destroy the new Alliance base in Stromgarde in a warfront. This is done to prevent the Alliance's full control over the Eastern Kingdoms and use Stromgarde as a staging point for attacking Gilneas. Gilneas is a large peninsula located on the southwest of the continent of Lordaeron. It lies south of Silverpine Forest and southwest of Hillsbrad Foothills, with Baradin Bay to its south and east, and Tol Barad to the west across the Great Sea. During the Cataclysm, the southwestern part of the peninsula, which included the town of Duskhaven, was destroyed by an earthquake sinking the land underwater. Map of the Ruins of Gilneas. Map of Gilneas during the earthquake. Map of Gilneas before the earthquake. Silverpine Forest 10 - 60 North By foot, or by flying methods. Hillsbrad Foothills 15 - 60 Northeast By swimming or flying to Purgation Isle. Gilneas is a large peninsula that juts into the sea south of western Lordaeron. Silverpine Forest lies to the northeast and Kul Tiras awaits across the sea to the south. Gilneas is a cold, rainy place, mainly because the sea surrounds the peninsula on three sides, making sea storms common. High cliffs on the shores protect the peninsula from sailors' curious eyes. The Greymane Wall in the northern border was constructed after the Second War and it is the only evident site in Gilneas. It prevents any pass into the peninsula. Brann Bronzebeard's theorized that Gilneas had been overrun by the naga. Despite being described as ruins, the zone has very little actually ruined in it. The city, while not pristine, is intact, and all major towns are untouched structurally beside Duskhaven. The only ruins in the entire zone are at the wall. The geography of the Ruins of Gilneas zone is identical to the instanced Gilneas after the flooding of Duskhaven. However, aside from phasing on a few quests, it is completely devoid of NPCs or mobs. The only mobs in the zone are some critters and beasts (including the uniquely colored Highlands Foxes, which are, oddly, absent in the instanced Gilneas zone). There are no mailboxes; even the ones that are interactable in the starting Gilneas zone are not clickable here. There are also no flight paths (except for one Horde flight path temporarily available in the Silverpine Forest questline); the only way in is by foot, swimming or flying mount. As such, reaching the Ruins of Gilneas is significantly easier for Horde players than Alliance players, whose nearest flight path is the far, far away Aerie Peak, while the Horde has flight paths in nearby Silverpine Forest and Hillsbrad Foothills. The fastest route for Alliance players is probably by flying mount from the northern coast of Dun Morogh or from Menethil Harbor; in both cases, the travel distance is just short enough to avoid fully depleting the fatigue bar with a 280% flying mount if flying in a straight line. This is no longer the case as of Legion, as the fastest way to reach the Ruins of Gilneas by Alliance players is by using the Dalaran Crater portal located in Dalaran; which places the player just outside of the region. On roleplaying realms, this zone is often repurposed as a roleplaying hub for Gilnean characters. The nearby Shadowfang Keep Meeting Stone can be used by both Alliance and Horde players as the fastest way of getting into the Ruins of Gilneas. After patch 3.1.0, the loading screen/ship route from Menethil Harbor to Theramore Isle no longer crosses Gilneas. At the launch of Battle for Azeroth, the zone was glitched and its zone map could not be uncovered. This was fixed with 8.1, though the map does not function the same way it used to. Previously, certain parts of the map would display subzone names. It is now all "Ruins of Gilneas", the only exception being the city, which maps "Ruins of Gilneas City". Gilneas City could be clicked from the world-map as one could with a faction city. This is no longer possible. Greymane Manor's map, which was previously broken since Mists of Pandaria, has been fixed. The town of Duskhaven, submerged by the Cataclysm. The rooftops of Duskhaven protruding from the water. Alliance troops patrol the main road to Gilneas City. The peninsula in Warcraft II. Gilneas in the WoW manual. Patch 7.3.5 (2018-01-16): Level scaling implemented, previous zone level: 14 - 20.